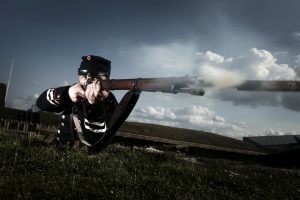 It rumbles and roars and smells of 1864 history in Sønderborg in the weekend from June 28 to Juny 30. 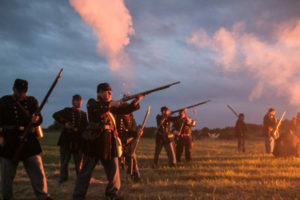 Saturday the soldiers’ camp is open with a host of activities for the whole family, all connected with the war in 1864. The soldiers’ camp is placed on the Kær peninsula north of Sønderborg. The main event is the scenario when the Prussian forces cross the Alssund under cover of darkness. We will re-enact the scene at the historically correct time, that is, 02.00 hours. The cannons will crash and the Danish ironclad, Rolf Krake, will appear in the gloom off Arnkilsøre and begin shelling the boats carrying the Prussian soldiers. 16.30: The Historical Brigade puts on a drill parade for the public. 16.45: Salute with the 1864 fieldgun at the Sønderborg Castle. Parade from Sønderborg Castle via Brogade to the Town Hall. 18.30: End of the parade at Sønderborg Castle. 10.00 – 18.00: The Soldiers’ Camp is open on Kær Vestermark north of Sønderborg. Entry: Adults 80 DKK, children 50 DKK. Tickets can be bought at the entrance. The ticket provides access to the Soldiers Camp Saturday and the re-enactment at night (very early Sunday morning). 2.00 – 4.00: The crossing of Alssund. The spectator area is on Kær Vestermark north of Sønderborg. Tickets can be bought at the entrance. A ticket for the Soldiers Camp Saturday also gives you access to the battle at night. 2 am: The Soldier camp opens. Feel the tense atmosphere and listen to stories from contemporary witnesses. A slideshow will be shown on a big screen and it is possible to buy coffee at the sutler. At about 2.40 the spectators walk down to the water, where the battle is introduced. 3 am: The Danish soldiers are on lookout and suddenly detect movement on the water. 2500 Prussian soldiers are on the way in rowing boats to attack Denmark. The Danish soldiers immediately begin shooting, but the Prussians manage to go ashore. A hard fight on cannons, guns and bayonets develops between the Danish and the Prussian soldiers. The ironclad Rolf Krake arrives and fires at the Prussian boats, but can it change the outcome? 4 am: The battle is over. The wounded are carried to the infirmary. The visitors meet the participants of the Historical Parade of Als.